Our exclusive Hayley collection is a neo-traditional series of modern regency style furniture where classic forms are updated with fine flourishes. The finish on these pieces is a dove white atop sandblasted oak veneers, creating a juxtaposition between a casual and traditional. The nickel you'll notice on the hardware and metal offers brightness, while the notes of white quartz provide an elegant accent. Add clean cut sophistication to your home with our Hayley collection. 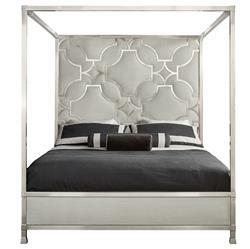 This king sized bed brings a big dose of drama and glamour to any bedroom. A brushed nickel decorative grill combine with a neutral fabric to create great textural appeal. The bold canopy construction is perfect for a space with high ceilings.